If the nation of Venezuela and Hugo Chávez had official Facebook pages (they probably do, in fact) their relationship status might be “It’s complicated.” No question, Chávez loved Venezuela, but the other half of the dyad, the 29.95 million Venezuelans, remains deeply divided in its feelings towards el Comandante. The common depiction of the country is one of a vast majority held hostage by a tiny cadre of privileged political extremists (No, that’s the USA, in reality) but Chávez and his administration have always enjoyed broad popular support, particularly from the poor. By a number of independently assessed measures, (i.e. : Gini coefficient) Chávez’s policies have benefited the impoverished. During his tenure, income inequality in Venezuela declined to a point on par with the US, and access to health and welfare services was greatly expanded. In last December’s municipal elections, widely viewed as a referendum on Maduro’s leadership, the government coalition earned 54% of the vote, a number higher than the slim 1.5% majority they earned in the March federal elections. Notwithstanding serious allegations of electoral fraud both times, a large segment of the population continues to identify with the Chávez vision of Socialism. For better or for worse, that vision actively embraces the Fundación Símon Bolívar, better known as el Sistema, through generous financial support of its activities. This money constitutes an inescapable relationship baseline between the giver and recipient: like it or not, Sistema and the government are connected, and the optics of this connection are proving increasingly problematic. I’m not, nor have I ever been, an apologist for Abreu or Dudamel. But I found the simplistic armchair punditry of Gabriela Montero (whom I greatly admire as an artist),and her public naming and shaming of Sistema’s two figureheads as distasteful as it was naïve. Her open letter was written from a place of great sorrow and great frustration, emotions shared by many in the expatriate community, but not from a perspective of great pragmatism. What outcome does she envision, were the two to “speak out” against the “dictatorship”? Perhaps she truly believes that the late Chávez and his successor are universally despised, and that one judicious word from the Maestros will foment sufficient public outrage to induce Maduro to resign. But that simply won’t happen, given the degree of support the government continues to command. Even if Venezuela were a tinderbox of oppression waiting for a spark, it would hardly be consistent with the mission and values of the Fundación to advocate for the overthrow of the administration, in the certain knowledge that bloodshed would ensue. The only alternative Montero might have envisioned is that Abreu and his disciple resign publicly, thus taking a stance that would deny them any opportunity to influence the course of the nation, and deprive them of the authority to safeguard the Fundación and its charges at a time of crisis. It would be at best a grand gesture. A pointless one, but grand nonetheless. Maduro would accept the resignation with a public expression of regret, thank them for their service, and promise to continue the work. And the work would continue. The reality is that Abreu’s political position is dangerous no matter what he does. With public sentiment so divided, political alignment in any direction would only serve to incur the enmity of the other half of the nation. For every child withdrawn from a Sistema núcleo because of the latter’s perceived anti-government bias, another is probably enrolled as a gesture of approbation and solidarity by pro-Chávez parents. Switch “anti” and “pro” in the preceding sentence and it still holds true. The least comfortable seat is the one on the fence, but that’s where the Fundación needs to be right now. The monetary policy of a fixed exchange rate, as instituted by Chávez in 2003, was an attempt to buy time for the government, quite literally, to extend otherwise unsustainable economic policies. As the Bolívar continues to devalue on the black market, its purchasing power in temporal terms has waned from years to months, perhaps even weeks. I’ve said this before: at some point, the party in Venezuela will be over and it will be time to pay the pipers. The social unrest, crime, inflation, scarcity of necessities and the electricity outages (in an energy rich nation?) are all escalating and may ultimately tip the balance in favour of the opposition. 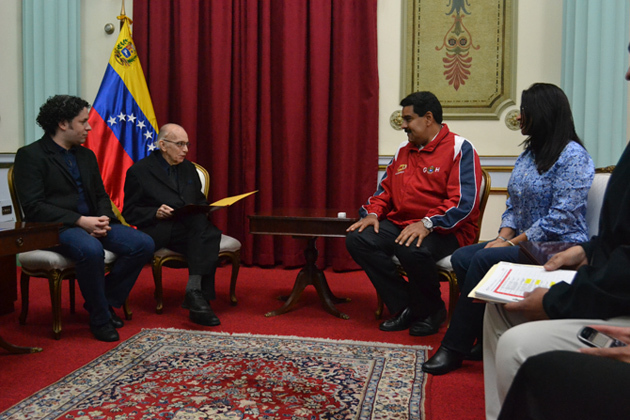 In the event of a national reversal along the political spectrum, how kindly disposed towards the Fundación will the new administration be, if it perceives Abreu as being an ardent supporter of Chávez’s Revolución Bolivariana? Strategically, neither Abreu nor the Fundación can benefit from a perception of strong alignment with any political party. The relationship that is visible, the relationship to which Montero objects so strongly, is the expansion of the relationship between any not-for-profit and its principal sponsor. The Fundación has obligations towards the government, not the least of which is expressing its appreciation publicly. And having bankrolled the massive expansion of Sistema’s domestic and international activities, the Chávez/Maduro government rightfully claims some association with its success. Negotiating this extremely fine line without angering someone is simply impossible. Imagine if this situation were unfolding in the United States. A President installed via electoral fraud (it happened) institutes policies that grossly violate the rights of the citizens (it happened). The economy tanks as a result of extremely poor oversight of the financial sector (it happened): thousands of people march in the street to protest the situation (it happened) and are met on multiple occasions with violence and further violation of their rights (it happened). Suddenly Rocco Landesman, then Chairman of the National Endowment of the Arts, or Christoph Eschenbach, Music Director of the National Symphony, steps forth to explicitly decry the situation and government. It sounds ridiculous. It sounds pointless. It is both. So why are these expectations levied at Gustavo Dudamel and Maestro Abreu? It is entirely their right to hold such a view. Their personal politics don’t change anything. Political alignment by the Fundación towards the current government still risks alienating a significant proportion of the people, and does not negate the strategic need for Sistema to think beyond this administration to the next, and the next after that. It’s easy to buy into the illusion that everyone within the Fundación, from Abreu right down to the 5-year old in a recorder choir, shares the generally liberal values that characterize the Sistema movement internationally. But politics are as controversial and divisive in Venezuela as they are in America or Britain. In my last blog entry I wrote of “introducing a few shades of grey into bichromatic dichotomies” … in other words, appreciating the fact that not everything is black and white. Like most of the international community, I’m concerned about the situation in Venezuela. I’m concerned for my friends across the nation. But I’m extremely hesitant to draw hard and fast conclusions about the actions of Abreu or Dudamel without any understanding of the challenges they face. Clearly Dudamel has acquired some diplomatic skills from his teacher: his response to Montero deplored the recent violence without apportioning culpability. And even if I find his assertion that “Music is the universal language of peace” to be untrue on all counts (Not universal, not a language, and a very long association with war) I still appreciate the sentiment, and the deft evasion of politicizing the Fundación further. We are in extraordinary agreement, even about who is running the US, though I suspect we may not have the same elite group in mind. There is something evil about publicly defaming the most generous and loving people you know because in some way they don’t live up to your expectations. How much this must hurt! It’s like spoiled children who have received everything from their parents and then scream, “I hate you” when Mom and Dad rightly draw the line. I am in the unusual position of being able to shed more light on Gabriela’s open letter. She is my wife. Of course, I could well be accused of bias, in my circumstances, and I assume that risk willingly, but I would like to think that what I can offer you here is an objective and educated insight into Gabriela’s sincerity and love for Venezuela, which virtues compelled her to speak out as she did. As you may know, Gabriela began “speaking out” with the release of her last album, “Solatino”. One year later, after reading the gruesome murder statistics published by the OVV, which showed Venezuela to be more dangerous than Iraq, Afghanistan or Syria at the time, Gabriela composed “ExPatria”, a musical portrait of violence, theft and corruption, dedicated to the 19,336 victims of murder in 2011. That number rose to 25,000 in 2013, and Venezuela’s corruption index now sits at the very bottom of the table on Transparency International’s list. These, however viewed, are damning and shameful statistics, and they represent painful realities for their victims and the families of their victims. Gabriela has a deep, abiding and personal love for the musicians of El Sistema. Believe me when I tell you this. Those who truly know her know this to be true. For Gabriela to write as she did was not easy or without consideration. While declaring her own position, she has resisted publicly challenging the leaders of the music community for a long time, but the murders of peaceful protesters a few days ago, while the music played on, represented the crossing of a line, as far as her conscience was concerned. It matters not who played which concert and where. The salient point she made was that it is morally unacceptable to remain silent in the face of barbarism, to play on as though nothing is happening in the world outside, whether last week or over the past few years. The ongoing events of last week were simply the ignition point for this overdue debate, one which must be carried out with the civility and due deference that Gabriela intended. She is painfully aware of the dichotomy you rightly outline above. El Sistema is undoubtedly rooted in a noble, socially moral ethic. But it faces a insurmountable moral impasse when it seeks to be funded by a government whose ethics diverge so far from any norms of morality that it is considered even more corrupt than Zimbabwe, and fellow despotic administrations in similar dark corners of the globe. This moral impasse can no longer be concealed in the convenient cloak of silence. So the question, in ethical parlance, becomes a utilitarian one of ends and means. Is is morally justifiable to continue to elicit funding for a socially beneficial music foundation from a government whose presence in Venezuelan society has been anything but socially beneficial, according to the statistics offered above? Is it morally acceptable, whether by intention or default, to export a civilized image to the world of progress and inclusion, while the domestic reality is one of uncivilized regression and division? When the very society in which that socially beneficial music foundation exists is in on the brink of collapse, is it not incumbent upon those with influence and iconic status to appeal to the hand that feeds them to restore law and order, before it is too late for everyone? Is it not in the realms of exceedingly poor taste, not to mention exquisite irony, to be entertaining Frank Gehry, the world’s most renowned architect, while the country outside of the musical bubble lies in ruins? Shouldn’t you build the nation before you congratulate yourselves with Gehry’s temple to success? Or am I, too, naïve? As Gabriela said in her analogy, when the Titanic sank, the quartet went to the bottom of the ocean, too. Put another way, the “nucleo” can not survive in a necrotic cell. Nobody is immune from the tragic effects of a failed state. History has taught us that painful lesson. THIS, no other, is Gabriela’s message. So it would be wrong to think of Gabriela’s letter as an attack, least of all on the musicians that she loves so deeply – and I sincerely hope they read this – with whom she has shared so many beautiful moments. Attacks are rooted in hatred, an emotion unrecognizable to Gabriela. It is, rather, an appeal, a rallying cry to those who are loved by Venezuelan society to speak up for the long-term good of Venezuelan society, even if that involves short-term risk to a music foundation that has been built over 39 years, confident that it now has enough momentum, power and prestige to demand better for the broader society without fearing its own permanent demise. To act otherwise, unfortunately, is to deal in hypocrisy, a moral equivocation that has no place in Gabriela’s conscience. For one can not purport to advocate on the one hand for social construction while tacitly supporting those who have overseen such manifest social destruction. It is simply a morally irreconcilable position, in Gabriela’s opinion, and one which requires enormous personal courage to declare publicly. So, I would conclude by saying that Gabriela’s message is far from naive, and far from simple armchair punditry. Sure, she does not live in Venezuela these days. Like Gustavo, she embraces the global free market in which she makes her living, the free market so despised by Chavez while he nonetheless conducted his affairs within its mechanisms, with his despised US as his primary customer. For practical reasons alone, Gabriela could not base herself in Venezuela during most of her adult life as a concert pianist. But believe me when I say it, she is Venezuelan to her core. Nothing brings her to tears quicker in her private moments than reports of murder and the destruction of social order in Venezuela. Nothing sends her faster to the piano, improvising, exorcising these demons in doleful minor keys. I witness it every day in our privacy. Anyone with an ability to analyze human motivations – follow the money trail and you will quickly see that her motivations are not financial – will understand that Gabriela’s rallying cry to her fellow professionals is rooted in her deep and enduring love for the country of her birth, for its survival, for its future, for its music, for its musicians, and mostly for the unity of ALL Venezuelans. She is no enemy of El Sistema, but a deeply loyal friend who speaks an inconvenient truth. Try to look beyond the words, where the message lies. Not unlike music, I suppose. With respect to the people of Venezuela at this difficult time, and with the hope that I will one day visit the country of which Gabriela has always spoken with such profound affection, and for which she now advocates with such dedication.